Barry was absolutely great t work with. I was nervous at first about getting a realtor to sell my family home of 25 years, and to get me a good price, especially since I am a widow with a son. I did not want to be taken advantage of. Barry sat down with me and explained his approach and how we would strategize to sell my home for top dollar. In fact, it sold within hours of listing, for a record price, well above listing. Barry was able to keep me calm while downsizing to my new condo. He went to bat for me in negotiations to make sure I did not get taken. Barry works individually with clients which allows him to give you his full attention. Anytime I needed to see a property or ask him questions, he was always available. 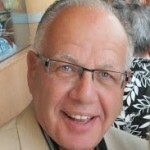 He was a great source for providing referrals for tradesmen, suppliers and real estate lawyers. His many years of experience in the field makes him an expert in the market and he counselled me in getting the best deal for my money. He was honest in his advice on finding me a new home that was good value. He didn't want me to just find anything and he steered me away from area that he knew would not be suitable for me. Barry is a lot of fun to work with and I am honoured to be his client. I would definitely recommend Barry for all your real estate needs.